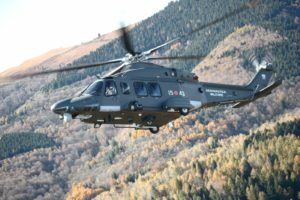 Leonardo announced on April 16 that the Government of Pakistan will introduce into service an undisclosed number of additional AW139 intermediate twin-engine helicopters. The aircraft will be used to perform utility, passenger transport and emergency medical service operations across the nation. The helicopters will be delivered in early 2019. This latest fleet expansion is a further step towards the completion of a fleet renewal program spread over several batches and highlights the success of the AW139. Leonardo is also delivering logistic support and training services for the growing fleet of AW139s in Pakistan. A significant number of AW139s are already in service in Pakistan, with several operated by the Pakistan Government for EMS/SAR, relief and transport duties. he AW139 is the perfect fit to Pakistan’s challenging operational environment, delivering outstanding capabilities and hot and high performance unmatched by any other helicopter type in the same class. The new-generation AW139 sets new standards in the market with advanced technology and class leading performance, reliability, safety, versatility and cabin space. The AW139 delivers significant power index margins in the most demanding conditions, demonstrated flights up to 20,000 feet, high cruise speed (165 knots), and is able to carry up to 15 passengers or a mix of dedicated mission equipment, litters and medical attendants in its spacious unobstructed cabin for transport and rescue operations.